72 degrees I thought was the no-brainer for V10's? V10s balance weirdly. But 72 is the traditional bank, yes. Rebellion's Toyota engines were always fully stressed, so was any Zytek or Mugen installation besides the Panoz. Champ Cars used to run four different engines as stressed members. It's not that hard. The GV has always been 72deg. That's the normal bank angle for a V10 otherwise you get some crazy vibrations that are worthwhile for F1 but pretty stupid in endurance racing. nope, thats not the case......the 5.5 V10 was based on the same modular casting tooling as the old LMP2 V8.......hence it was 90 Degree bank angle for the very last AIM version raced.......if you look at this image, you can see its 90 degree, dont really need a protractor, if it was 72 degrees you could see it instantly. Also the Judd wording does state "a new 72 degree cylinder block".....which I interpret as moving away from 90 degrees. Overall my point is Judd are creating a problem for themselves which will force an un-needed chassis interface change, which could scare off either the chassis manufacturers or the teams.....not the best starting point. And even with the "stress mounted" Indy Car engines, they were about the same bank angle, and "adaptor" doesn't mean a tube frame. Indy Cars used to use a "sheer plate" that was designed to allow dimensionally different engines to fit the same tub as well as to break the engine away with minimal damage to the tub. You have to remember that a lot of the cars that used Judd engines (like Courage and Lola) were customer cars that had to take various engines that could be stipulated by the customer. I think that none of the customer LMP1s will use fully stress mounted engines. It's not like Audi Sport, Porsche and Toyota who designed their cars and engines to be stress mounted and as a single cohesive unit. Even though it was designed as a F1 engine, I don't think that anyone ever stress mounted a Judd V10, not Pescarolo, not Courage, not Dome, anyone as far as I know. I think that all LMP1 privateers will use some adapter to semi-stress mount the engines in their cars. 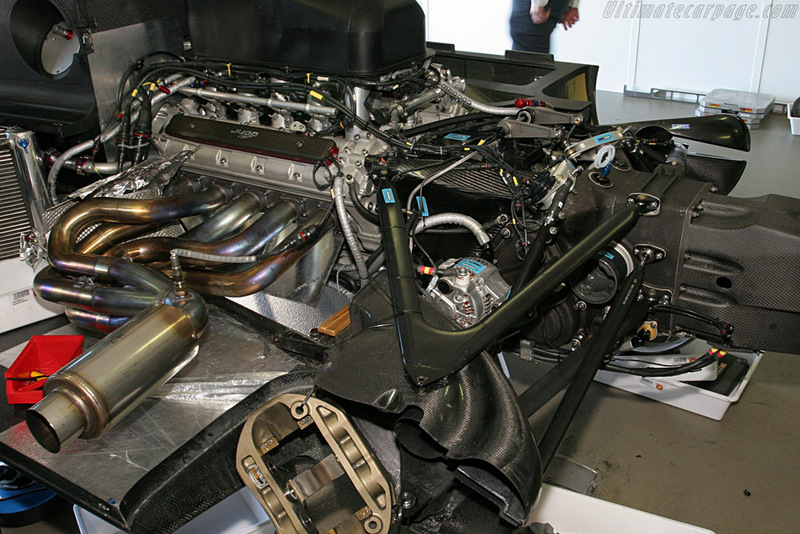 Don't know if ACO lmp2 cars use gibson engine as a fully stress element, surely they do, but anyway I think that dallara chassis used for cadillac dpi has a different and customnized rear subframes than usual to fit GM powertrain. Same can be said about nissan powered ligier. Don't think it is a surmontable engineering hurdle for dallara and ginetta. The Oreca 05 tub, was able to fit the Nissan NA v8, HDP turbo v6, Toyota NA v8, AER turbo v6, the new Acura turbo v6 (I'm not sure if it's the old HDP) and they are ofering the same tub as Oreca 09 for LMP1. It is the 2016 IMSA P2 engine, which may have also been the DP engine that saw limited use. The ACO P2 engine is a smaller displacement version. Ohh I'm wrong, the Oreca tub never have had a HPD v6 turbo before, it was the Ligier, sorry. However, the Oreca tub is able to accomodate the current Acura. However, the Oreca tub is able to accomodate the current Acura. I'd like to hope so, or Penske may have a problem. Ah, those ones were never referred to as a Judd and the vast majority of teams kept the GV so I forgot about it. I figured the new part of the 72 degree block was just the weight reduction. I really don't think putting a narrower bank angle engine in a closed cockpit car will be a problem anyways, I mean look at how they crammed the GT-R engine into the Ligier. Right now prospective LMP1 customers who would even be looking at a normally aspirated non-hybrid car are worried about being at least somewhat faster than an LMP2 without breaking without a lot of testing or development more than anything. The lower vibration configuration should be better for that. What does a mounting plate have to do with the engine being a stressed member or not? The only thing holding the bellhousing to said plate is the engine. They also ran big fat V6s in Indy cars until 1996 and tons of them had stock block V8s put in them at some point or other. If kolles was able to modify the tub of the ADESS lmp2 (originally powered by the judd-bmw V8) to fit inside the AER V6 twin turbo, why oreca shouldn't be? Anyway the acura dpi already made some test, so the engine is already where it has to be. My point is that if you truly want to "stress mount" an engine directly to the tub, both the tub and engine have to be designed for it. Most stock block engines can't be stress mounted because they weren't designed to be a chassis element. It works in F1 with multiple engines because the FIA stipulates in their technical regs that the engines have to be 90 degrees and share common mounting points on the tubs. There's nothing in the ACO's tech regs, as seen by the Audi diesels being 90 degrees (V12 and V10) and 120 degrees (V6), Judd having 72 and 90 degree V10s, the Nissan V6 being 60 degrees, everyone else's V8s being 90 degrees and the Toyota V6 and Porsche V4 being 90 degrees. Only way for a customer chassis to accommodate various engines is have different mounting points for a stress mounted engine (difficult and cost/logistics prohibitive), or use tube frame or plate adaptors that bolt to the tub. You also have to remember that most of the customer engines don't have the oil tank mounted on the front of them like the factory built engines do, at least when mounted in the factory cars. The factory teams have the advantage of designing their car around one particular engine and the chassis around that given engine. Then I guess its just a case of length.......the V10 is 622mm long......as a guide the DB V8 is 516mm......the HK V8 is 584mm.......so it sounds doable. I'm surprised of no mention about direct injection as its worth about 5% fuel save.......a biggy for WEC type racing, it will need to be implemented at some point. Overall I would love to see this V10 motor back in endurance racing, hopefully a new LMP1 customer will take the plunge once the chassis orders start to flow for Oreca, Ginetta and BR-Dallara. It would be great to have Judd back and the sound of a v10. At the moment the only available engines for P1 that I know are Nissan v6 turbo, Mecachrome v6 turbo, AER v6 turbo and the Judd v10. Cosworth said years ago that they have a v8 turbo (build over the base of the old IRL v8 NA engine), but it needed money (from the customer) to finish the development.